Las Vegas, NV (April 25, 2018) – GDC Technology Limited, a leading global provider of digital cinema solutions, announced today the completed integration of its TMS-2000 Theatre Management System (TMS-2000) with the Screenvision Media preshow. The integration enables automated ingestion and programming of ad content directly from Screenvision Media’s server to GDC’s new Cinema Automation CA2.0 and its TMS-2000, the second most deployed theatre management system solution globally. The integration provides Screenvision Media’s network of exhibitors with preshow trimming functionality to maximize time available for preshow advertising between every show. “This is a major milestone for Screenvision Media as many of our customers have deployed GDC’s robust theatre management system. The integration of GDC with our preshow delivery provides the U.S. market with alternatives when creating a fully integrated cinema workflow,” said Mike Henry, SVP of Information Technology at Screenvision Media. 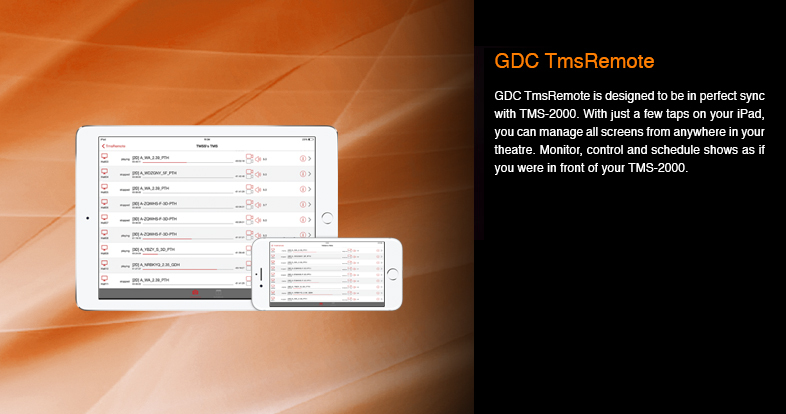 The TMS-2000’s robust capabilities include integrated screen monitoring, with playback and equipment status displayed from a single access point; an enhanced Content Manager, which enables centralized management of content and KDM; a smarter Show Scheduler, which gives alerts regarding missing CPL or invalid KDM; and Smart Restore, a function that makes server replacement easy and instant. Meanwhile, Quality Manager is an optional module that brings users excellent value in ensuring the right level of projector brightness, crisp color and crystal-clear audio. In addition, a newly developed mobile app extends theatre management to mobile platforms for complete ease of use. “Since the launch of the TMS-2000 at CineAsia 2014, the list of U.S. exhibitors who solely rely upon it to provide simple and efficient centralized management has grown exponentially. Accordingly, integrating with leading provider, like Screenvision Media, makes perfect sense for GDC. GDC TMS installations are now able to ‘switch on’ automated preshow integration with Screenvision Media. The compliance of ad playlist delivery is now in place for nearly 1,000 screens with GDC products and Screenvision Media,” said Annie Wang, executive vice president of GDC Technology (USA) LLC. GDC Technology Limited (‘GDC’) is a leading digital cinema solutions provider. GDC develops, manufactures and sells media servers, content storage systems, theatre management systems and network operations center software for the global cinema industry. GDC is a licensee of the DTS:X object-based immersive sound technology from DTS, Inc. for the development of its media servers. In addition, GDC also provides a suite of digital cinema products and services, including integrated projection systems, 3D products, projector lamps and silver screens. GDC Digital Cinema Network Limited, a GDC subsidiary, manages VPFs for over 6,300 theatre screens and with more than 650 studios or motion picture distributors worldwide. Headquartered in New York, N.Y., Screenvision Media is a national leader in cinema advertising, offering on-screen advertising, in-lobby promotions and integrated marketing programs to national, regional and local advertisers, and providing comprehensive cinema advertising representation services to top-tier theatrical exhibitors presenting the highest-quality movie-going experience. The Screenvision Media cinema advertising network is comprised of over 15,000 screens in 2,300+ theatre locations across all 50 states and 94% of DMAs nationwide; delivering through more than 150 theatrical circuits, including 7 of the top 10 exhibitor companies. For more information: https://screenvisionmedia.com/.